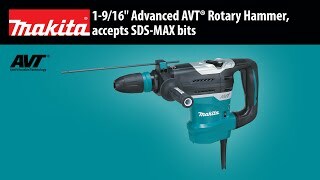 The 1-9/16” AVT® Rotary Hammer (model HR4013C) has 45% less vibration and 20% more impact energy than the previous model. It is engineered with enhanced Anti-Vibration Technology (AVT®), a synchronized three-component system for significantly less vibration. The result of the enhanced AVT® is a category-leading vibration rating of 5m/s². The powerful 11 AMP motor delivers 8.4 ft. lbs. (11.4 Joules) of impact energy, 20% more than the previous model for faster drilling. An added feature is the option of lock-on or trigger-activated in the “chipping only” mode, with a push button start/stop control for more convenient operation. The HR4013C is engineered for a range of concrete applications including drilling/coring through-holes for pipes, setting larger anchors, securing tilt-wall supports, small chipping applications, and more. It is ideal for a range of trades including masons, concrete contractors, demolition contractors, plumbers, electricians, sprinkler installers, and general contractors seeking a best-in-class rotary hammer. 2-mode operation for "Chipping Only" or "Hammering with Rotation"
Optimum Range (concrete drilling) : 5/8" - 1-1/4"
Max. Capacity (concrete drilling w/ core bit) : 4-1/8"
Net Weight : 15.1 lbs. Shipping Weight : 27.8 lbs.